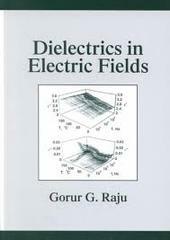 Examines the influences of electric Fields on dielectric materials and explores their distinctive behavior through well established principles of physics and engineering and recent literature on dielectrics. Facilitates understanding of the psace charge phenomena in the nonuniform fields. Containes more than 800 display equations. An exceptionally crafted field reference or text for seniors and graduate students in power engineering tracks! Contains more than 800 display equaitons.